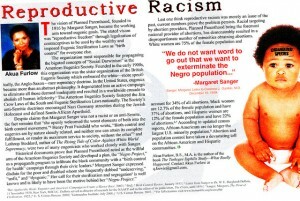 A tract distributed by the Human Life Alliance, photographed by ***Liz***, Flickr CC. Most people think of access to birth control as a women’s issue, but its history is a lot more complicated. Melissa Wilde and Sabrina Danielsen describe the birth control movement’s tangled web of race, class, and religious dynamics in the American Journal of Sociology. They argue that women’s rights were not the central concern in the religious debate over birth control—instead, religious leaders focused on the preservation of Whiteness. In “Fewer and Better Children: Race, Class, Religion, and Birth Control Reform in America,” Wilde and Danielsen categorize the pervasive religious groups of the early 1900s by their attitudes toward contraception and “race suicide”—the eugenicist belief that White Anglo-Saxon Protestants were being outbred by southern and eastern European immigrants. Based on religious articles and sermons, they find a surprising amount of overlap between the two topics. In fact, the American Eugenics Society recruited many religious groups to the cause of legal birth control. The central debate between outspoken birth control advocates and opponents often came down to whether people in the second wave European immigrants (specifically Catholics) were considered White. All religious groups seemed to agree that widespread use of birth control would most strongly impact birth rates among the poor, but Christian sects in the North supported birth control to minimize Catholic growth and preserve traditional Whiteness and Protestant dominance. Christian sects in the South opposed birth control in hopes that the immigrant Catholic community would expand and become recognized as White to counteract the growing Black population. Both sides of the debate left little room for any discussion of women’s rights. If anything, the authors find, religious leaders assumed that White members of their own congregations would avoid using contraception in order to reproduce more than ever. Ultimately, the historical religious birth control debate boiled down to an argument over which kind of White supremacy would suit the United States best.